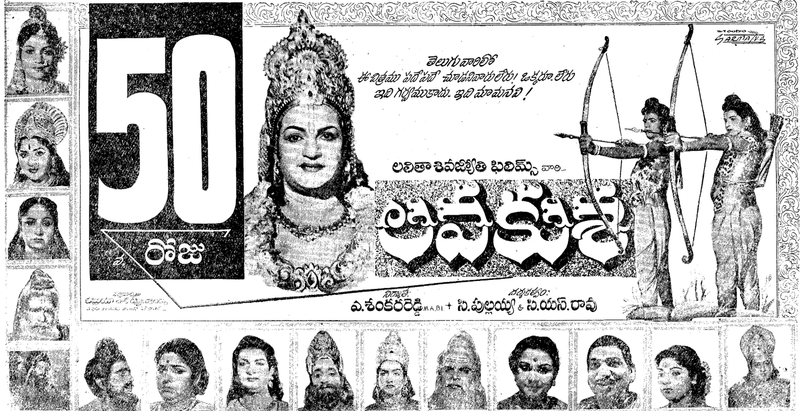 Trivia: This is the first Telugu movie collected Rs. 1 crore at the box-office, where as the tickets rates were from 25 paisa to 1 rupee. This was released in 26 centers and had a 100-day run in all the centers, which was a record. It run 150 days in all those centers. It celebrated silver jubilee in 18 centers. 1.98 crores of people saw this movie, while the population of Andhra Pradesh was 3 crores at that time. For instance, 4,34,800 people saw this movie at Raja Rajeswari Theate, Warangal, while the town's population was only one lakh at that time as per the statement given by the owner of the theatre. 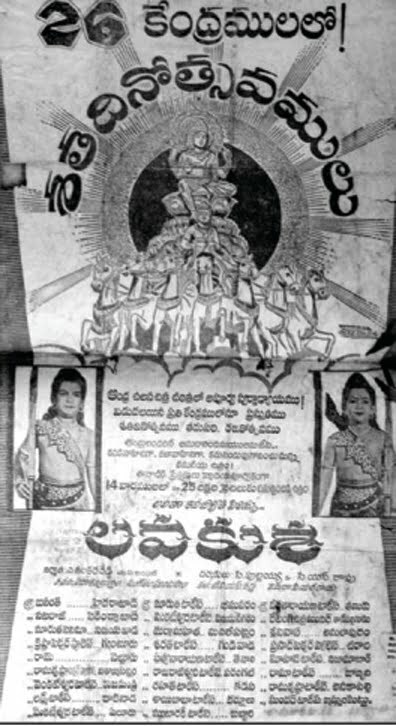 It had a 100-day run in Bangalore thrice, i.e., in 1963, 1977 and 1980. Even no other Kannada movie reached this record till now. This film's shoot was started in 1958, but it was released in 29 March 1963. 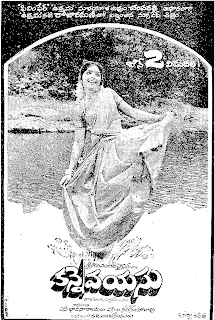 Devaki Bose in Bengal made the first ever-Indian film on this subject, with Prithviraj Kapoor playing Sri Rama. This was made under the banner of East India Film Company. This was based on a stage play that was popular by then. C Pullaiah who was also working there was attracted to this subject. The Film Company wanted Pullaiah to make this in Telugu. The script is same for both. Set material like chariots and costumes are same. Balijepalli wrote the script in Telugu. He thought of employing a new actor who carries some feminine charm, as a sloka in Ramayana described Sri Rama so. 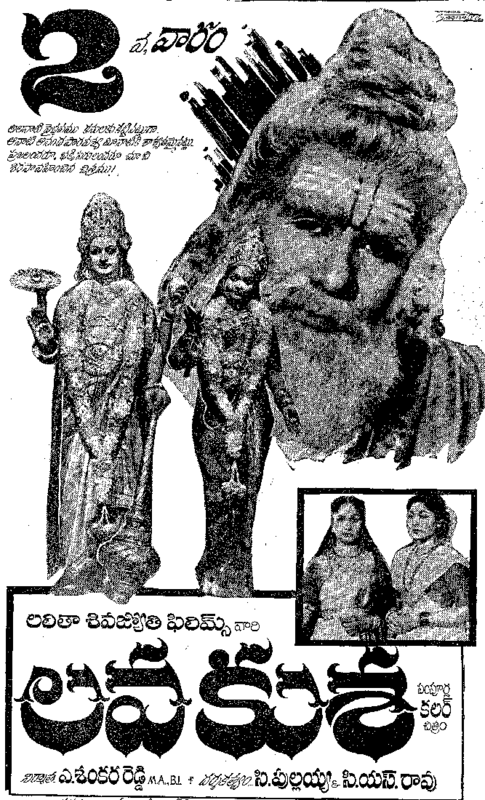 They scanned the Telugu theatre and found Parupalli Subba Rao, playing Radha in the stage play 'Radha-Krishna'. Sriranjani (Senior) was chosen to play Sita. They also scanned for artistes to play the three brothers of Sri Rama, having features a bit nearer to Parupalli, to give an impression that they were all born to one father. This was all 1934 story. The film was a hit. Then the same subject was again made in Geva color 24 years later, in 1958, by Lalitha Sivajyothi's A Shankara Reddy. But Modern Theatres' Tamil film 'Alibaba and forty thieves' was the first South Indian film in Geva color. Telugu cinema was behind in this aspect. Better late than never was the motto of Shankara Reddy and decided to make this in Geva color. 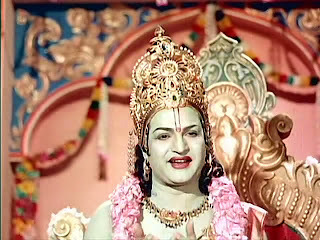 'Lava Kusa' is recorded today as the first color film in Telugu film history. Vauhini Studios was the choice to make this magnum opus. There was a big garden in Ramavaram, opposite MGR's house, where the set of Valmiki Ashram was laid. The film was made in Telugu and Tamil languages simultaneously. NTR, Anjali Devi and Nagaiah figured in both the versions. The script too is the same except that Telugu film has many verses. However, the film was to be halted suddenly because of early commitments of the artistes to play in other films. The production of Lava-Kusa was postponed, for almost four years, after the completion of eight thousand feet edited version. Another twelve thousand feet film was yet to be shot. The sequences set in the Ashram was completed. But Sri Rama's scenes in the huge palace were pending. The climax was also due. Producer Shankara Reddy got into financial troubles. He was upset. But he was a man of courage and wanted to complete this project. By the time he could collect the needed money to re-launch the production, another problem arose. Director Pullaiah fell sick. He could not even move. Who would complete this film was the big question. 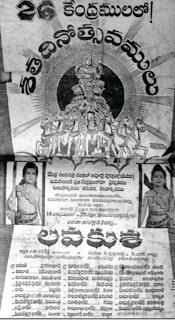 Sundarlal Nahata, its distributor suggested the name of Pullaiah's son CS Rao. 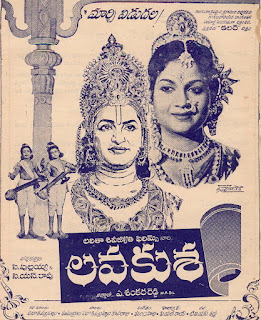 The latter met BN Reddy who was planning to make a film on the subject of Sita. CS Rao requested him to take up the making of the remaining part of Lava-Kusa. BN politely refused and advised CS Rao to continue the work of his father, as 'the film belongs to you and to your father, you will succeed'. 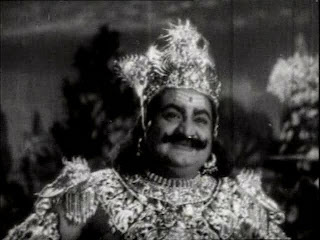 Rao completed the film, which became a history in Telugu cinema. But this gap of nearly five years made some artistes look old – especially the boys who played Lava and Kusa. You wont miss that when you watch them taller in some scenes and shorter in other scenes. The Tamil version faced a different kind of problem. Lava's role was given to a girl. By the time the film was restarted, she grew into a young woman. Therefore Lava cannot be shown bare-bodied any more. These characters of the twins in Telugu are shown just wearing a small cloth covering their shoulders. But in Tamil, the cloth was replaced with deer's skin on the shoulders of both Lava and Kusa. It was released in the year 1963. The great effort and the relentless struggle of the producer Shankara Reddy and CS Rao's skillful handling on the footsteps of his father bore fruit. The film was a great hit.